Assessing the sheer diversity of nominations for this award has been a pleasure from first to last. Nothing could confirm in more striking fashion the importance of these buildings—both architecturally and historically. The care with which so many incumbents, owners and admirers prepared their applications is also heartening testi mony to the affection in which the English parsonage is still held. With well over 100 outstanding nominations received, it has been surprisingly difficult to narrow down the field to just 12 finalists. The real challenge of this process—which was undertaken by a small team from Country Life and Savills, the sponsors of the competition—is to try and judge the relative merits of buildings that vary so enormously in character and setting. This is not, after all, simply a competition about architectural merit. The particular appeal of parsonages lies in their combination of architecture and location; set among fine gardens or in a prominent location on a village green beside the church. In the right circumstances, even relatively modest buildings can look remarkable. A case in point is the vicarage at Dedham, Essex, which narrowly missed selection. This small medieval house is set in the very heart of the town, beneath the tower of the church it serves. Such is its appeal that Constable recorded it in several views. And how is Dedham to be set against the splendours of another near-finalist, the grand Georgian rectory at Castle Hedingham in the same county, a prominent feature of a village that also boasts a medieval parish church and castle of the first importance? It is a mark of the strength of the competition that neither building was chosen. The history of parsonages has been an equally important consideration. Among the nominations that also just fell short of the final selection were two fine rectories with connections to Thomas Hardy. He is reputed to have designed The Old Rectory at Hawkchurch, Devon, when it was rebuilt in 1856, and to have met his first wife at the front door of St Juliot, Boscastle, in 1870. His architectural notebook contains a sketch of the ground floor of the house. Several nominated parsonages were designed by celebrated architects. The Old Rectory at Rampisham, Dorset (currently undergoing restoration), was designed by Pugin and preserves many original internal fittings, down to the front-door key, which still works. Other buildings are fine examples of a particular style of design, such as the Arts-and-Crafts Rectory of St Peter’s church in Ealing, Greater London, built in 1910. At Betchworth, Surrey, the Old Rectory retains various Victorian features, including William Morris wallpaper. Most of the buildings in the list of nominations remain family homes. There were, however, one or two remarkable exceptions to this. 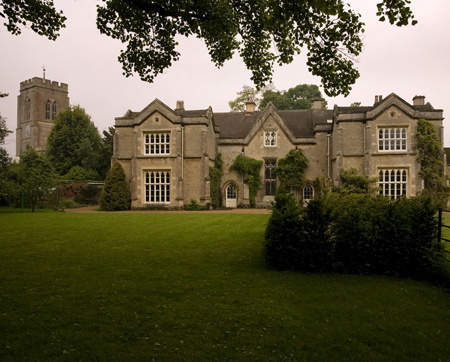 The old rectory at Bishop’s Cleeve, Gloucestershire (now Cleeve Hall), was sold by the Church in 1972. It was bought and restored as offices by Bovis Homes in 1998. Their work revealed a fine 13th- century medieval roof and the buried skeleton of a horse. The house also preserves a series of early-19th-century views of the Slad Valley, near Stroud, Gloucestershire, painted on the walls, reputedly to remind a rector’s wife of her former home. Another former rectory with an unusual history is Pendragon House in Cornwall (also presently being restored). It was the site of a small and non-profit-making farm during the Depression, and, at its height in the 1930s, employed 54 people, a project that attracted the attention of Country Life and Pathe News. Pendragon House has had many celebrated visitors, including John Betjeman. During one stay, he remarked on the austerity of the interior, and by the time of his next visit, each baluster of the main staircase had been painted a different colour. A panel of three judges will visit the finalists in the four regions of England: North, South, East and West. Each panel will comprise one member of COUNTRY LIFE; another from Savills; and an independent judge: architect Ptolemy Dean (West); Rev Dr Michael Higgins, a trustee of Save Our Parsonages (North); the author Lucinda Lambton (South); and James Miller, a trustee of The Rectory Society (East). The regional winners will be announced in Town and Country over the summer. All the judges will meet to decide the outright winner, which will be featured on September 17. This house was largely built in 1841 to a design by London architect Edward J. Andrews.